Discussion on differences in shock valving and how it affects drag racing applications. Baseline adjustment procedures for aluminum body rear shocks. Learn how to adjust your new rear shocks and prepare for your first pass with them. 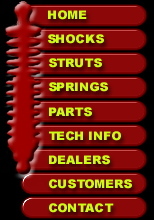 Baseline Adjustment Procedures for aluminum body front shocks. Learn how to adjust your new front shocks and prepare for your first pass with them. Baseline adjustment procedures for steel body rear shocks. Learn how to adjust your new rear shocks and prepare for your first pass with them. Baseline Adjustment Procedures for steel body front shocks and struts. Learn how to adjust your new front shocks and prepare for your first pass with them.